Posted on Tue, Sep 27, 2011 : 1:22 p.m.
Plans to expand public transit services in Ann Arbor and build a new downtown bus station have garnered a showing of support from the federal government. Ann Arbor Transportation Authority officials said today $2.7 million in expected grant funding from the Federal Transportation Administration is now officially obligated. The funding includes $1 million to demolish and rebuild the Blake Transit Center and $1.7 million to add 10 more hybrid buses to the AATA's fleet. 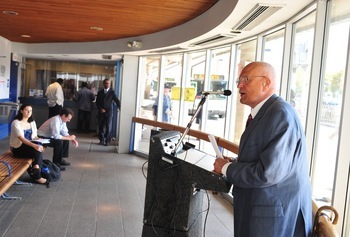 U.S. Rep. John Dingell, D-Dearborn, speaks to a crowd inside the Blake Transit Center last fall. "This funding will play a critical role in expanding and enhancing transportation options for Ann Arbor to help us retain, create and attract jobs to Washtenaw County," U.S. Rep. John Dingell, D-Dearborn, said in a statement. "I am very happy to help Mayor John Hieftje and AATA’s CEO Michael Ford continue their outstanding work." The AATA is planning to undertake a $5.5 million project to build a new two-story Blake Transit Center starting in spring 2012 and finishing by spring 2013. Plans include tripling the transit center space from 2,000 to 6,000 square feet to allow for more office space, increased public restroom space and a remote dispatch center. AATA officials said the agency has received a total of $4.2 million in state and federal grants to support the project, and they've submitted a grant application for the remaining costs. Engineering and architectural firm DLZ Michigan Inc. has been selected to design the new bus station to meet LEED certification. Another Michigan firm, Spence Brothers, will be providing construction management and oversight. AATA officials said the purchase of 10 hybrid electric vehicles will increase the number of hybrid buses in the agency's fleet to 41 out of a total of 78 buses. The grant comes from the federal Clean Fuels/Bus and Bus Facilities Program. Ford, head of the AATA, issued a statement today thanking Dingell for his assistance in securing the grant funding. "You cannot have a growing economy without robust access to transportation," he said. "Fortunately, Congressman Dingell understands this connection very well." When first proposed, the cost for the Blake Transit Center project was estimated at between $2.7 million and $3.7 million. That went up to $4 million in 2010, and now to $5.5 million. Mary Stasiak, a spokeswoman for AATA, said there are a number of reasons for the increased price tag. She said the original estimate was before any design work took place. She said the AATA held a number of stakeholder meetings to get feedback about what users would like to see in the facility, and that led to additional features. "The original estimate did not include the addition of a basement," Stasiak said. "We are also adding more office spaces. The getDowntown folks will be in the building. We also added more public restroom space than was originally estimated. And we're going to be adding a remote dispatch center so that in the case of an emergency we have a backup." Stasiak said final designs are expected to be finished around December. She said they'll have to be approved by the Planning Commission and City Council. Stasiak also confirmed that the way the two-story building will be positioned on the site will allow for the possibility of future development above Blake Transit Center. "We're talking about moving that building. It's not going to reside in the space it's in now," she said, noting it'll be moving to the southeast corner of the same lot. "And by doing that, it allows for any future development to use the original footprint of the northwest corner, and the southwest corner can be used for added footing for a larger building on top." If somebody is interested in a development that makes use of both the AATA site and the city's Y Lot, located adjacent at the corner of Fifth and William, that could happen, she said. Wed, Sep 28, 2011 : 9:40 p.m.
And what type of &quot;art&quot; will glamorize these new buildings? Wed, Sep 28, 2011 : 4:17 p.m.
Federal tax money (from me) added to state, county, and local tax money (also from me) for an unneeded building to create a photo-op for Dingell's never-ending campaign. Also in today's headlines, AATA is adding to its taj-ma-bus offices for overpaid administrators. I cannot afford either Dingell or the AATA. Wed, Sep 28, 2011 : 2:33 p.m. Didn't we just spend money renovating the existing building? Tue, Sep 27, 2011 : 9:21 p.m.
With gas at $4 gallon and buses getting between 4-8MPG, can't we use the money to buy Natural Gas buses instead of hybrids? The Natural Gas is at $1.60 to $2.00 a gallon (equivalent). Next time you're filling up at Meier, check out the people filling up on Natural Gas. Hydraulic Fracturing aside, there is a serious glut of Natural Gas in this country, not to mention no wars are necessary to guarantee the supply. This is a no-brainer because I bet that government grant doesn't cover fuel. Tue, Sep 27, 2011 : 8:11 p.m.
How much will this increase the cost to ride? Tue, Sep 27, 2011 : 7:10 p.m. I am glad to see AATA service continuing to grow. Mass transit is the future. Tue, Sep 27, 2011 : 6:59 p.m. This is good news for Ann Arbor. I appreciate the Congressman's efforts in this regard, other than his statement about our Mayor's &quot;outstanding work&quot;. This Mayor hasn't done anything outstanding in years, other than dream up ways of collecting and spending more money that the citizens of Ann Arbor generally don't want collected and spent (think ART) and/or thinking up the most ridiculous ordinances (think crosswalks), and otherwise making foolhardy decisions (think reducing police and fire positions). Let's hope that everybody remembers to vote in upcoming elections, not only against the Mayor, but also his cabal of people on the city council. There are several reasonable city council members so do your homework, but many who follow the Mayor without question need to go. Tue, Sep 27, 2011 : 6:05 p.m.
OK, that's all great and stuff, but what's wrong with the one we already have. The last time I saw the place it looked just fine to me, anyway. I'm no pro-transit major, but it has a place to stay warm in the winter and cool in the summer, restrooms, benches, a huge covered outside waiting area to get on the buses, and really what's wrong with that place again?